Last Updated: Apr 16, 2019 @ 1:57 pm. Best Travel Stroller 2019: We waded through 11 strollers pitched for travel—folding, unfolding, stuffing into travel bags—until we found the very best travel strollers. We pick the Mountain Buggy Nano ( $199.99) as the Best Travel Stroller for North America and the UPPAbaby Minu ( $399.99) as the Best Travel Stroller For International Trips. Scroll down for our picks for Best Travel Stroller for International Trips and Best Travel Stroller Splurge. New to stroller shopping? 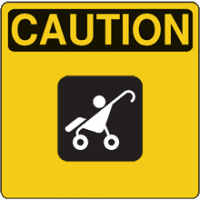 Read our 7 Things No One Tells You About Buying a Stroller for advice and tips. Strollers specifically designed for travel have taken off in years, thanks to parents desire to hit the road and new designs that fold up so compactly they can fit in an overhead airline bin. In years past, most folks would rely on a cheap umbrella stroller, so named because they resemble an umbrella (long and skinny) when folded. The big problem: these strollers were routinely NOT allowed in overhead bins and thus became checked baggage or gate-checked. The result was often mangled strollers that were damaged or destroyed by malevolent baggage handlers. Too bad the Pockit as a stroller was such disappointment—from the joke of the canopy to the awkward two-hand fold to the horrible handling, the Pockit worked better on Facebook than in real life. On the plus side, the Pockit’s success at getting attention launched a travel stroller arms race, with several brands jumping into the “ultra-compact fold” category with better offerings. We count 11 travel stroller offerings today, with prices that range from $100 to $500. FYI: We divide up our recommendations here into two travel categories: domestic and international. Why? Well, in surveying our readers, we noticed two distinct needs here: when flying within North America, most parents need a lightweight stroller that works well on smooth sidewalks with an occasional fold for a rental car trunk or airline overhead bin. Yet that same stroller that works well for a stroll on the smooth paths of the Arboretum in Dallas would be out of its league on a trip to Europe, Asia or beyond. You need a stroller with beefed up wheels and suspension to handle the cobblestone streets of Avignon or the stone pathways in the market at Sorrento in Italy (“Look at the size of those lemons, honey!”). Overseas, there is more reliance on public transport, which means more folding/unfolding, more stairs and the like. So here are our recommendations by travel destination. Affordable, yet well-designed. The Nano is the easiest to fold and has a reclining seat. Bonus: it works with a large number of infant car seats. The Best Travel Stroller: North America. The 13 lb. Mountain Buggy Nano is a dark horse in this category—especially since parent Mountain Buggy (part of the Phil & Ted’s stroller group) is better known for its beefy SUV-like strollers, such as the Urban Jungle. The Nano, on the other hand, is a compact travel stroller that impressed us with its flexibility and overall quality . . . at a price that doesn’t break the bank. The star here is the quick fold. And we mean quick. Ok, the fold requires two hands—but it is much easier than other travel stroller we tested. When folded, this seat scrunches up to 21″ x 12″ x 20″. At 13 lbs., the Nano is easy to carry from its crossbar when folded. The 5″ wheels and tight turning radius make it easy to steer in tight places. Overall, we liked the stroller’s handling and quality—note the little features like the brake that won’t mess up a pedicure. The reclining seat on the Nano is good for napping older babies, but the company still recommends babies should be six months or older to use this stroller. Cool feature: an extendable footrest to make naps cozier. One final big plus: the Mountain Buggy is car seat compatible—it’s universal adapter works with our top pick, the Chicco KeyFit 30. Competitors either have no car seat compatibility or they only work with pricey Maxi Cosi type seats (the Cybex Aton, etc). Even if you never use the car seat capability, the Nano can hold a baby/toddler up to 45 lbs. Accessories like a rain shield and mesh cover for wind in a combo pack ( $29.99) and a reversible liner for more padding or just a different look ($50) complete the Nano with extra travel flexibility. Flaws but not deal breakers. The flip side of the small wheels is this—the Nano doesn’t perform as well on varied terrain. Sure, smooth sidewalks and grass are no problem. But note: there is only rear-wheel suspension, so that makes for a bumpy ride when you take the Nano anywhere else but relatively smooth surfaces. There is very little storage in the Nano and the basket only holds 11 lbs. worth of stuff—so anything besides a small diaper bag would be too much. The Nano’s smallish canopy comes in for a good amount of criticism. One reader noted it lacks a peek-a-boo window and the coverage it offers is minimal. Weirdly, when retracted, the canopy blocks the handlebar . . . so most folks use the canopy in the extended position, whether they need it or not. Bottom line: Well, no stroller is perfect. Despite these imperfections, we recommend the Mountain Buggy Nano as the Best Travel Stroller for North America. Pricey but worth it—one hand fold, all wheel suspension, large storage basket. Best Travel Stroller for International Travel. The UPPAbaby Minu ain’t cheap ( $399.99) but ticks all the right boxes for international travellers. Full coverage canopy with pop-up sunshade and peek-a-boo window? Check. Multi-position recline (babies can use as early as three months!)? Check. Large basket that can hold 20 lbs. worth of stuff? Check. What we loved the best about this stroller during our testing was the smooth glide and all-wheel suspension. Combine that with 7″ wheels in back and the Minu can handle more terrain (yes, even cobblestones) than our domestic travel pick, the Mountain Buggy Nano. And yes, this stroller looks more fashionable than other travel strollers—note the leather handle bar and the brakes that are sandal and pedicure friendly. The UPPAbaby Minu weighs nearly 15 lbs. and doesn’t have as compact a fold as the Nano (it is three inches longer). That could make it a tighter fit in older or commuter airplanes that have smaller overhead bins. A few of our readers didn’t like the storage baskets low entry, which means some items can roll out if not contained in a bag. And the car seat compatibility for the Minu is meh. Yes, it works with UPPAbaby’s own Mesa car seat and the Maxi Cosi/Cybex Aton like seats . . . but that is it. No adapter for Chicco, Graco or other popular seats. On the plus side, the other accessories for the Minu are better deals: $20 for a rain shield, for example. The UPPAbaby’s “from birth kit” ( $129.99) enables you to have an infant lay flat in a bassinet-like attachment for the Minu. Yes, these features extend the Minu’s usability, which is great. Just note that most of these other uses for the Minu (car seat adapters, from birth kit) aren’t as travel-friendly as the basic Minu seat up. Example: you can’t collapse the stroller with the from birth kit or car seat adapters installed. Still, if you were planning to use this stroller from birth to toddler travel years, the extra functionality is impressive. Bottom line: the UPPAbaby Minu is an excellent stroller for travel, especially for those going abroad. This stroller weighs a pound less than the UPPAbaby Minu and folds up into a smaller cube—but what most folks love is the sleek styling with white-wall tires and bubble canopy. Best Travel Stroller Splurge. In the “if you have to ask, you can’t afford it” category of travel strollers, let’s spend just a moment on the BabyZen YOYO+. Yes, leave it up to the French to design the objet d’art that is this stroller, with its curved frame and multiple color packs to change the stroller to fit the current mood. We love the “white-wall tire” effect on the Oreo cookie wheels. FYI: We did recommend the Babyzen YOYO+ in our round up of lightweight strollers here. But that review focuses more on everyday use than as a travel solution. Leaving the style and price aside, the BabyZen YOYO+ is a rather impressive travel stroller—at least for travel that involves smooth sidewalks and paths. At 13 lbs., it is about a pound LIGHTER than the Minu reviewed above. And it folds into the SMALLEST cube among the non-joke travel strollers (we are looking at you, GB Pockit)—20.8″ x 17.5″ x 11″. Yes, that is a length and width that is 3+” less than the Mountain Buggy Nano or UPPAbaby Minu. So what’s not to like? Where to begin? Let’s start with HOW BabyZen sells this stroller on a la carte basis, which we find confusing. For example, Buy Buy Baby sells a frame BabyZen for $450. Then you have to buy a separate “color pack” which is the stroller seat and canopy for another $50. Oh, and you first must decide if you want a YOYO that can be used from birth (the “+” model) or one from six months and up. Start adding in accessories and that YOYO+ soars into the $700’s. Fans of the YOYO+ say the fold is something you can master over time, but we prefer strollers with less steep learning curves. Another flaw: while the wheels are stylish, we didn’t think the stroller handled as well on varied terrain as the Minu. This was probably because the small wheels in back don’t play nice on uneven surfaces compared to the Minu’s larger cousins. So the YOYO isn’t the right stroller for Europe’s cobblestone streets, in our opinion. And why is the YOYO’s brake so pedicure un-friendly? That seems like an odd oversight for such an expensive stroller. And don’t get us started on the storage basket, which is hard to access and rather dinky. This might not bother you if you use YOYO+ around town, but for travel, you really need that basket. So it’s a mixed review for the YOYO. We can see why the fans of this stroller love it so—and that’s why we will recommend it as a splurge. But its flaws and price put it behind our top picks, the Nano and Minu. PreviousWhy is someone trolling Lansinoh? NextTarget car seat exchange 2019: FAQ, Best Deals!